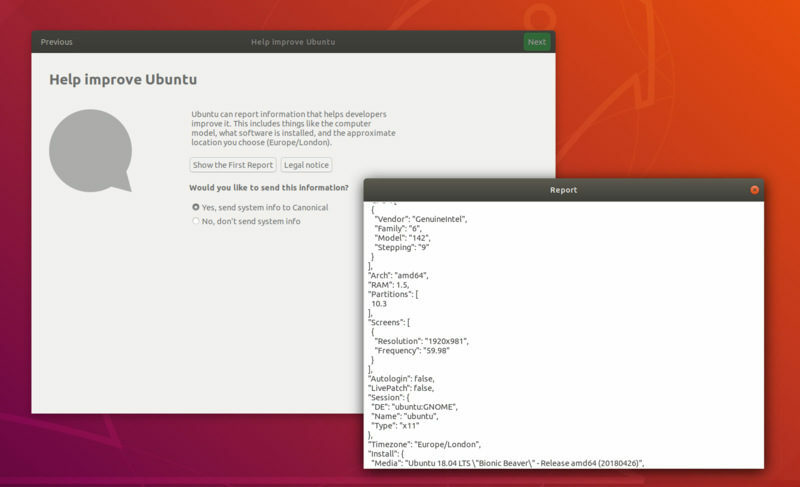 Brief: Ubuntu started collecting some basic, not-personally-identifiable system data starting with Ubuntu 18.04. Two months after Ubuntu 18.04 release, Canonical has shared some interesting stats. If you have been following the Ubuntu 18.04 related news, you probably already know that with version 18.04, Canonical started collecting some stats at installation time. You get the option to opt out of data collection at the Welcome Screen. The first report on the collected data is out. Canonical hasn’t provided the raw data, just some stats in percentage. They also haven’t disclosed the sample size as well so we don’t know if the stats are from 1000 users or 100,000 users. 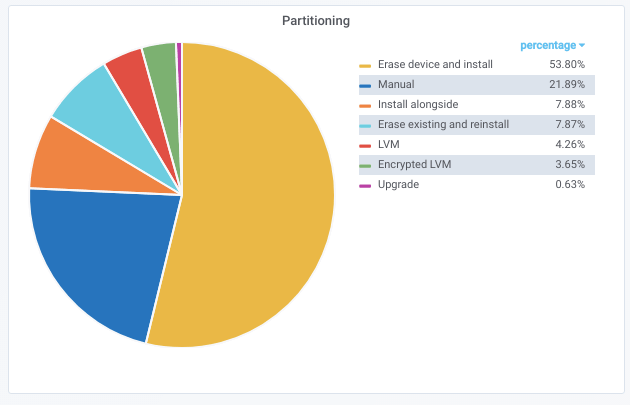 The report does provide some interesting insights into how people use Ubuntu and what kind of configuration they opt for their Ubuntu install. 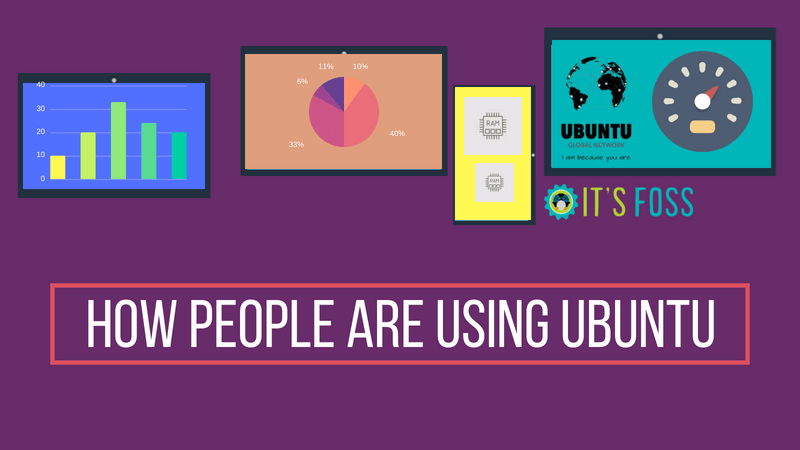 67% of Ubuntu 18.04 ‘opted’ to share their data. I deliberately used quotes on opted here because data sharing is opt-in by default. If you don’t want to share your data, you have to specify after the first install, on the welcome screen. As the human nature goes, many people just click on Next after Next without reading. I am sure if the opt-in was not enabled default, the sample size of collected data set would have been less than a third of the current one. Personally, it takes me less than 10 minutes to install Ubuntu. But as per stats, 18 minutes is the average time for Ubuntu installation. Guess what? Ubuntu team is going to improve on this further. Meanwhile, I remember that my Windows 10 update certainly takes more than 10 minutes with several reboots in the process. Most people have opted for ‘erase device and install’ option indicating that Ubuntu is their primary and only operating system. Encrypting the disk is not favored at all. Over 90% users download the updates while installing while 53% users installed the third-party codecs. Personally, I don’t like doing it while installation because it delays the install if your internet is slow. In either case, updating the system is one of the first few things to do after installing Ubuntu 18.04. What surprised me that around 30% of people opted for auto-login. Weird! 1080p i.e. Full HD is the most common display. It is followed by 1366 x 768 screen resolution. Unsurprisingly, HiDPI and 4k are not common. USA has the most number of users followed by Brazil, India, China and Russia. To me, people using 128GB RAM came as surprise. What about you? What do you think of the data collection and anonymously shared stats? What did you find the most interesting here? Some images have been taken from official Ubuntu blog. In Mongolia, Almost all cyber security and network students are uses ubuntu linux. But mirror server not working in mongolia. It still problem. Very interesting thank you. I don’t mind sharing my hardware info as long as its been noticed Canonical. I’ve 6 gig on my Acer notebook PC as a matter of interest. Windows 10 really takes longer than 10 minutes to install and I attribute the extra minutes to having to close holes/ports and disable all those feeble apps that’s accessing my internet and curbing the start menu’s apps also accessing the internet. Very frustrating install from Win 10. Though I find Ubuntu installs relatively easy and less frustrating. 30% auto-login is probably for the same reason I have one machine on auto-login — it’s a media server, so I want it up all the time, and have it boot and auto-login when the power fails.